with the new stamps that were just released! timeless style wise so i kept it simple with flowers and rhinestones to match the silver. used another fun die called Peacock feathers that i cut in silver. It looks so pretty. I can hardly wait to give this to them :) I hope they like it. 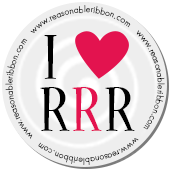 ribbon is from Really Reasonable Ribbon and it too went perfectly. layering different dies and the sentiment fit perfectly on the top one. are all cling mounted so they really are easy to stamp with. Here is our Blog Hop Schedule and the dates each designer will be posting (Click on each person's name to go to their blog): The is still 2 more days with chances to win. What a beautiful present and card to give. They will surely love it! Wow! What a stunning gift, That card is exquisite. Love it! WOW - what a STUNNING gift Teresa!!! LOVE your BEAUTIFUL shadowbox and ADORE your GORGEOUS card!!! SO MUCH DELIGHTFUL detail - LOVE IT ALL!!! both pieces are beautiful and are wonderful gifts. So stunningly beautiful! I have two weddings coming up and love this inspiration! These are both absolutely gorgeous! And I am sure they will love the shadowbox frame gift! It's amazing! that quote is so true! great examples. Well wow! I like all of your cards and the shadow box, I would never of thought about using the stamp that way. It is clever and a great job on all of them. My daughter just got married in September. I need to make a frame like this!! What a lovely gift ensemble! your shadowbox is so sweet. it will be a treasure for many years to com and the card is beautiful. These two projects are gorgeous. The compliment each other. Absolutely breath-taking!!! Your gift and card are incredibly gorgeous. Love how you kept the colors understated.....sooooooooooo elegant. These will be treasured by the happy couple. 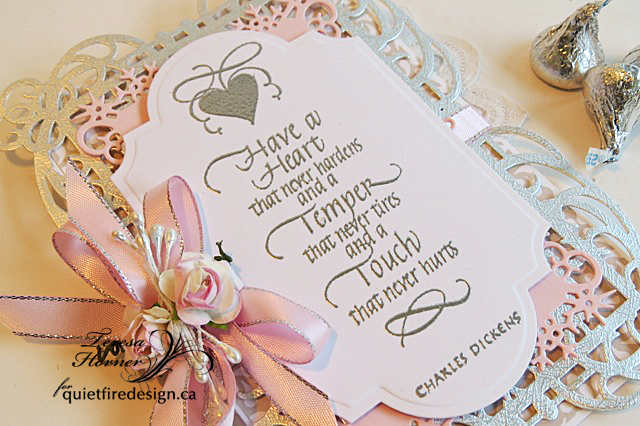 beautiful gift ensemble and everything worked together perfectly with the fab charles dickens stamp saying! Absolutely stunning! Thank you so much for sharing! Wow! They should treasure this forever. These are awesome works of art. Beautiful shadow box frame & beautiful card Teresa! Love them both. Great job on the wall art and that is a pretty special quote!! Great job! I'm sure your nephew is going to LOVE that shadow box, how elegant and beautiful :) Love the card as well, very pretty work. Silver embossing is very elegant, and I know how hard it is to get every little bit of 'stray' stuff OFF that card for a 'clean' look! Great job! They're both lovely! I love the elegance of pink and silver. What a lovely set... love the colours you chose! What a wonderful gift for your nephew! It is definitely timeless and elegant - sure to go with their decor in those neutral tones. Beautiful!!! The sentiment fits into the layout so beautifully. The layout is great. Love the card. It is so pretty. thanks for sharing two great things. Just exquisite! :) Love all the intricate detail. The mystical embrace is one of my fav dies. Both these projects are just gorgeous but my favourite is the box frame, stunning! Wow, the shadow box is stunning! What a lucky fellow! O love the muted colors and the elegant touch of silver. The card is a beauty too. Love them both! I'm sure they'll love it! Well, both the frame and the card - great keepsakes. I really love shadow box frames! They give you the chance to add much more depth to your design thann a traditional card. That being said...that card is amazingly beautiful! I love the silver accents and ink you used for the stamp! Gorgeous project all around! Wow your projects are just amazing! I am sure your nephew and his new wife will love them both! Thanks for the inspiration! I'm sure your nephew will be delighted with this gift. The design and the colors are perfect for the photo. Thanks for sharing. Simple, yet very elegant. Thanks. Beautiful sentiments on both of your lovely projects! Love the framed piece... a fabulous keepsake gift! Absolutely LOVE these SENTIMENTS!! 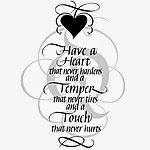 I've NEVER liked a set of sentiments so MUCH!! Will DEFINITELY be getting these!! Thanks for another BEAUTIFUL card!! What a truly special wedding present! 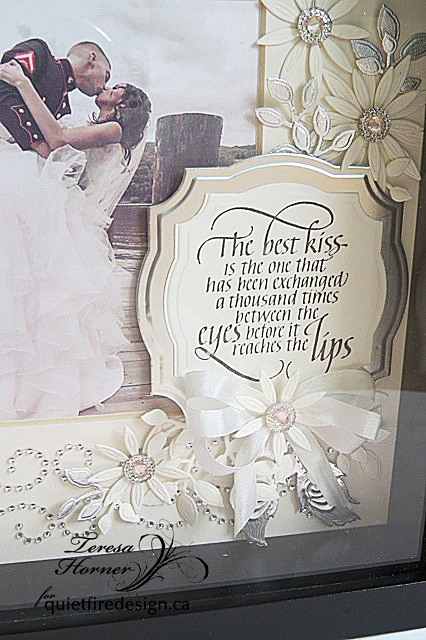 The kiss sentiment and your choice of silver and cream complement the photo of the happy couple. The beautiful shadow box is a gorgeous gift and will be appreciated. Love how well the stamp goes with the picture along with beautiful embellishments. The card, just finishes off this wonderful gift that will be treasured for years to come. Wow! I am literally speechless these are both so stunning! I LOVE them both! They are absolutely gorgeous! I LOVE the sentiments, the flowers, the embossing, the shadow box style frame on the first one, and the card base on the second one. I could keep going and going with how much I love these! Outstanding creations! 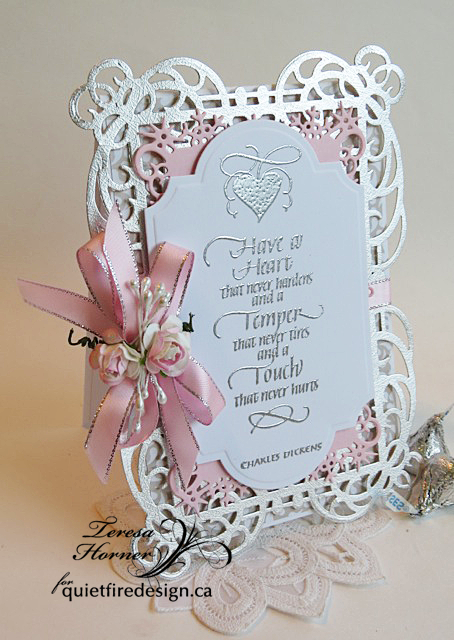 What a stunning card & gift you've designed! How could your nephew & his new bride not fall in love with it? I love the colors you chose. The silver adds all the sparkle it needs. How absolutely elegant and beautiful. Truly a work of art. Thanks for sharing. Love the rich, romantic look of these. I bet your nephew and his wife will treasure this for years to come! It is absolutely stunning and the card is beautiful also! I am betting they will keep that too! TFS! Both the cards are very pretty. The embossed sentiment looks great. The sentiments suits both gorgeous your creations! Stunning shadow box...your nephew and his wife will love it! Swoon. I love it. I want to make something like this for my daughter and son-in-law. What an incredible gift! I hope they treasure it forever. Just wonderful. These will look wonderful in the bride's scrapbook. Now I have to buy another Spellbinders die! A very lovely shadow box. OMGosh.....Love LOVE L O V E the Shadow Box & GORGEOUS Card!! A beautiful design and finished product. Your frame and card are so stunning. The stamp is so special and just perfect for your design. So soft and pretty. Perfect for a wedding gift. Gorgeous projects, love the photo, perfect gift and the card is stunning. Both your shadow box and card are both totally lovely. Thanks for sharing. Love both the frame and card! Just gorgeous!! Thx so much for sharing your creativity. What a great card! What a beautiful wedding card! Really beautiful design and great use of techniques. A perfect "marriage" of photograph and sentiment. A wonderful gift. The card is amazing. Hope you are able to hand deliver these and see their delight! This is such an awesome idea. Would be nice for 25th and 50th anniversaries also. What a fantastic project! I am sure the bride and groom loved receiving this. The card is the perfect companion. Your work has a beautiful delicate touch.. love it! 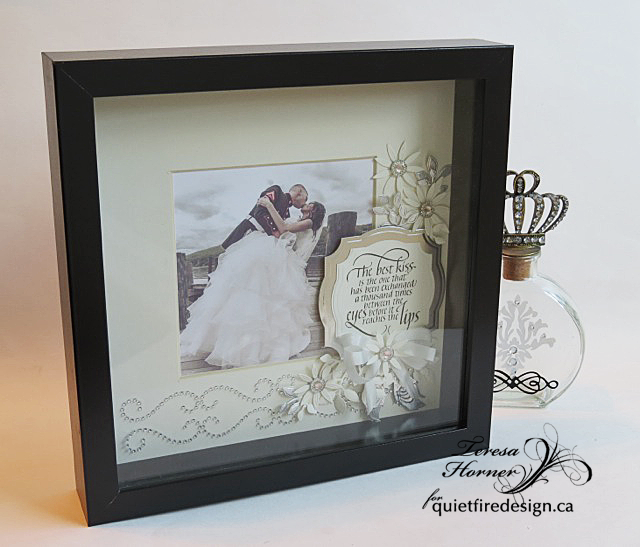 Wow - what a gorgeous gift you made with the wedding photo-- it is stunning, Therea! And the card to go with - love using Brilliance inks - so juicy and ready for embossing! It's beautiful as well - thanks for sharing Theresa! Delicate and sweetly romantic...really like it. 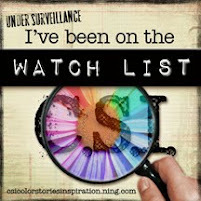 A gorgeous addition to the blog hop. Especially like the frame with photo and sentiment. But both are lovely! This is a treasure the newly weds will treasure for many years. The photo of the happy couple is reminiscent of the iconic WWII sailor kissing a woman in happiness as the war ends. I love the frame you did for their picture. The shadow box is a marvelous gift. Lucky nephew! The card id is truly lovely. What beautiful projects! Love them both! Love the arrangement in the frame and the card is devine! beautiful. Your nephew and his wife are going to LOVE your gift. What a gorgeous photo! This is beautiful and a treasure I'm sure your nephew will appreciate forever! Thank you for following me over on my blog, I thought I'd pop over to say hi and of course, I'm returning the favour... your work is gorgeous!! !